Binia Feltscher’s Swiss team extended Team Canada’s gold-medal dry spell on Sunday night at the Ford World Women’s Curling Championship. Feltscher’s team from Flims — third Irene Schori, second Franziska Kaufmann, lead Christine Urech and their Canadian coach Al Moore — claimed its country’s second straight gold medal on Canadian soil, stunning Canada’s Rachel Homan 9-5 in the championship final. The Swiss, who won gold with Mirjam Ott at the helm two years ago in Lethbridge, Alta., scored back-to-back threes in the eighth and ninth ends to send a crowd of 4,856 pro-Canadian fans home from Harbour Station disappointed. It was Switzerland’s fourth gold medal in the 36-year history of the World Women’s. Canada, meanwhile, fell short in its bid to win its 16th gold medal, and first since Jennifer Jones prevailed in 2008 at Vernon, B.C. The Swiss, who lost 8-3 to Canada in the Page 1-2 playoff game on Friday night, hung tough for much of the night. 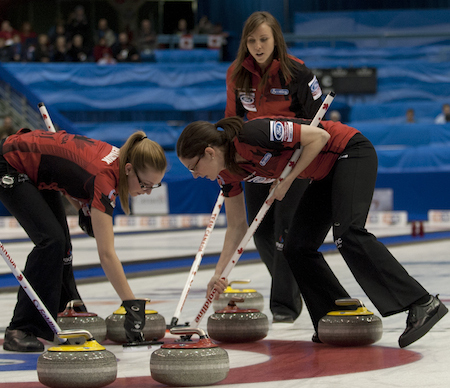 After two blanked ends to open the game, Canada broke through in the third end to with a deuce. 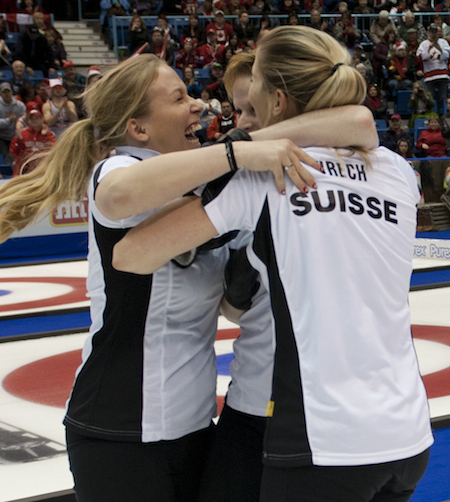 Switzerland tied it an end later, but Canada restored the two-point lead in the fifth end, and got an amazing runback double takeout from Homan in the sixth that forced Switzerland to a single. But the Swiss would turn it on from then on. Canada was held to one in the seventh, and ran into big problems in the eighth, leading to Feltscher’s open draw for three in the eighth end. In the ninth, a series of misses led to Switzerland having three rocks buried. All Homan could do was attempt a slashing raise takeout; her rock just failed to curl enough and left all three Swiss stones counting for a steal and an insurmountable lead. During the closing ceremony, Kreviazuk was named winner of the Frances Brodie Award for fair play and sportsmanship, after a vote by the players. Later this week, the focus shifts to Beijing, where the 2014 World Men’s Curling Championship, presented by Ford of Canada, gets underway on Saturday at Capital Indoor Stadium. Canada’s Kevin Koe team from the Glencoe Club in Calgary — third Pat Simmons, second Carter Rycroft, lead Nolan Thiessen, alternate Jamie King, team coach John Dunn and national coach Rick Lang — open play on Saturday against Denmark’s Rasmus Stjerne. 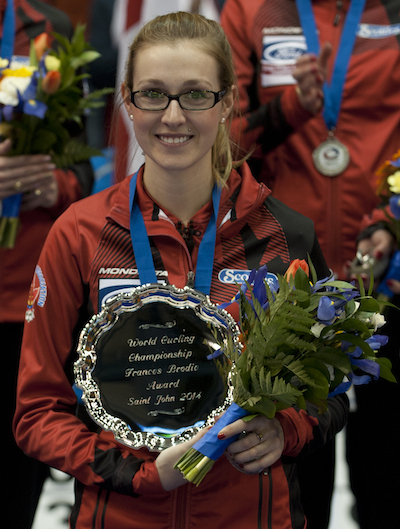 The French version of this story will be available at https://www.curling.ca/2014worldwomen-fr/ as soon as possible.